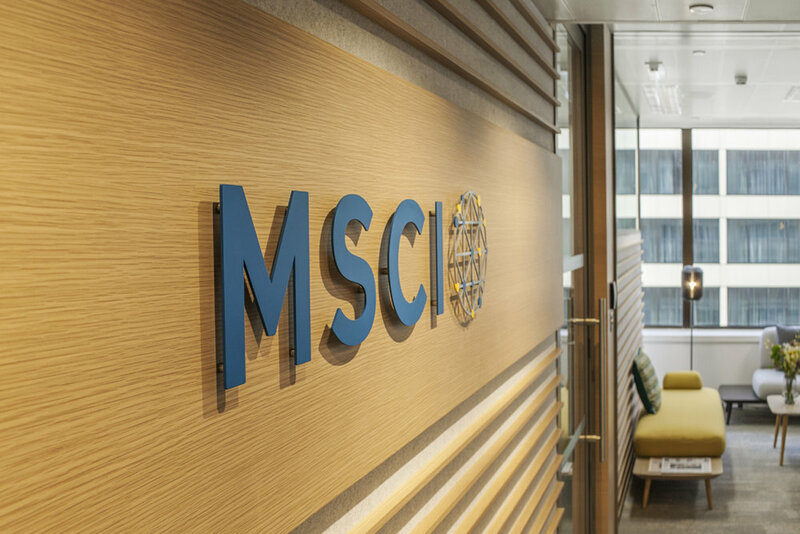 With more than thirty offices worldwide, MSCI, a leading provider of investment decision support tools, longed to establish a global design standard that could be applied across all their international offices to consistently reflect their brand and identity. As the first workplace to undergo a redesign with this goal in mind, the Hong Kong office proved to be especially challenging due to its small footprint. The Hong Kong office needed to accommodate workstations for a staff of 83 as well as a reception area, café, conference rooms, private offices, small breakout spaces and an area to hold company-wide gatherings. This was achieved by creating transitional spaces. The café, which includes banquettes and low and high-top tables, functions as a breakroom but also provides an alternative meeting space during non-meal times. The boardroom, adjacent to the reception and equipped with a folding conference table and demountable partition wall, transforms from a traditional meeting room to an open space for company-wide gatherings or client events. Multi-functional spaces include meeting rooms, quiet pods, and a wellness room. Pulling from the company’s color palette, soft, calming tones are used throughout workspaces while bright pops of marigold, blue, and red were applied to communal and client-facing areas such as the café and reception. Newly designed signage includes a 3-dimensional company wordmark and logo on a wood-slatted feature wall creating a warm but modern, dynamic feel. Distraction banding and privacy panels, applied to glazing throughout the office, were custom-designed using the company logo and pattern. All of these elements will eventually be incorporated in new and existing MSCI offices.